Our class curriculum consists primarily of non-traditional Kajukenbo. Kajukenbo is a hybrid martial art that features the best of many different martial arts. The techniques taught in class are primarily “Hands-On” self defense techniques designed to teach you how to quickly defend yourself against attackers by using fast hard strikes to your opponents’ vital body parts as well as using many blocks, counter strikes, follow-ups and take-downs. The unique style of our classes allow students of many skill levels to work together. Allowing beginner, intermediate and advanced students to work with each other empowers them to pick up these advanced techniques very quickly. 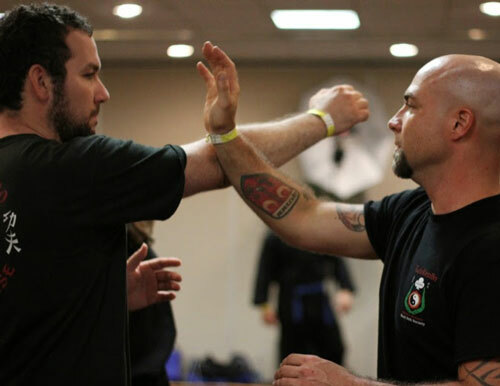 Kajukenbo is a constantly evolving martial art and students are encouraged to make the art their own by focusing on styles which specifically appeal to their individuality. This is a “Hands-On/Grab” program. You will learn to assert yourself while gaining a sense of Accomplishment. When training as a beginner you must be willing to listen and look. Jay can’t make you good, he can only show you the way. You will not master the martial arts over night, it will take patience and time. Within one month, Jay will know how much you have to accomplish. You will improve your self awareness and understand your body mechanics and see how your body works. Once you understand your basic body mechanics, your training will become much easier. It will be up to you to decide how much dedication and time you’re ready to put into the program. Your skills will be tested and your capabilities will be determined. Your individual limitations will dictate your speed and progress through the program. ​You will learn how to understand each movement you make and why you made it. Your movements are always changing, it all depends on the opponent you are facing. You must learn how to adjust! You will also learn how to intercept your opponent’s next movement and shut them down. You will be taught many techniques which will allow you to disarm and disable your opponent or simply get them out of the way. If you have considerable patience and are ready to provide close and thoughtful attention to instruction, you will become a master. If you’re looking for serious self-defense training, then Jay’s classes are for you. Classes are for men, women, boys (15 years+) and girls (18 years+). Classes are for men, woman, boys (15 years+) and girls (18 years+). Regularly scheduled classes are held on Tuesday, Wednesday, Thursday and Saturday. Students have the option to choose how many classes they would like to attend each month. Classes are paid for ahead of time each month. There are currently many different classes to work around your busy schedule. Class space is based on availability. Call 318-221-0999 for more information about available class spaces.